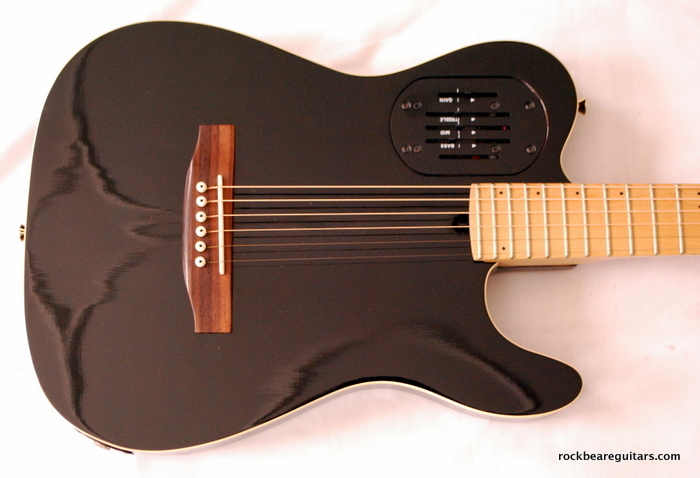 The Acousticaster is Godin’s interpretation of a guitar that looks and plays like an electric but sounds like an (electro)acoustic. It was one of the first of this kind of instrument, and remains one of the best. 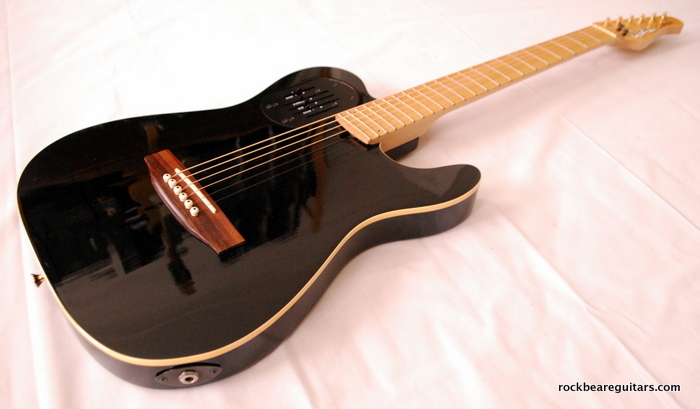 It has an onboard L R Baggs piezoelectric saddle transducer and powerful preamp which enables accurate tone shaping. Part of its natural tone comes from eighteen tuned, resonating tines of metal embedded in the base of the body, which add a resonance to the sound. Like all piezo-equipped acoustics, it is susceptible to clunking if played too hard, but it sounds great through the excellent dedicated AER Acousticube acoustic instrument amplifier. And it’s light, portable, comfortable and resists feedback. 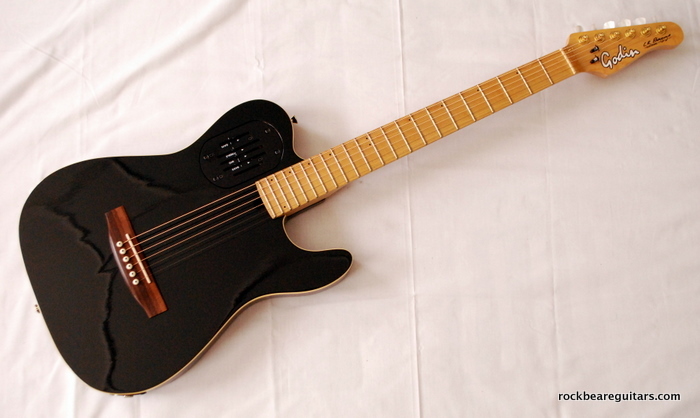 It was also made in 12-string, bass and fretless bass versions, all of which sound really good. 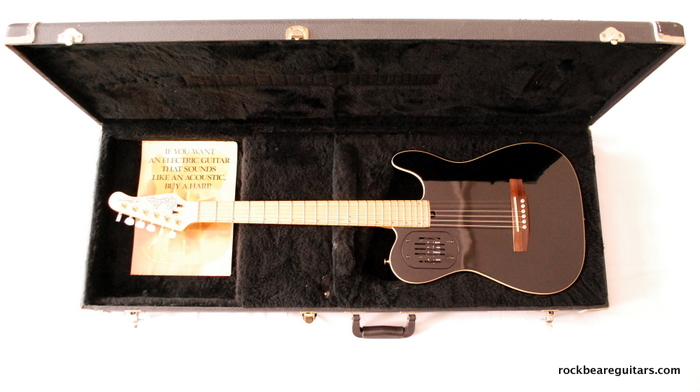 I have one of these acousticasters with nylon strings. 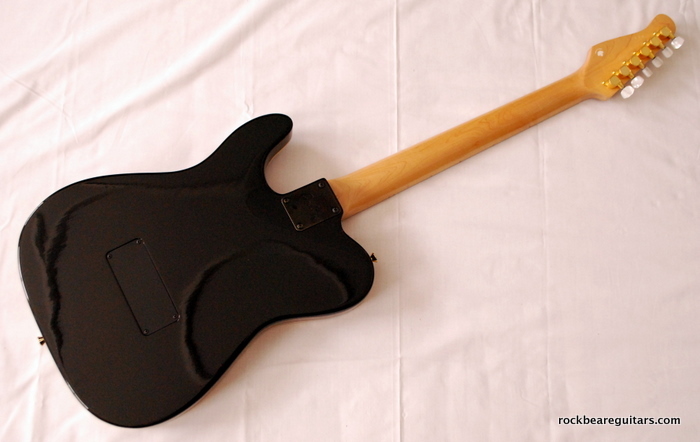 I think mine may be the first production year as it does not have Godin on the headstock but its on the back. The preamp runs on 2 nine volt battery’s and the case is mint. Very nice guitar but then again its Canadian built. Interesting – I wasn’t even aware they did a nylon variant and there are very few pix on the interweb of earlier Acouticasters with control plates and nylon strings. Thanks! I have a late 90s black 12-string acousticaster. LR-Baggs model, no preamp, no batteries.